San Francisco has a history of responding to a crisis with pragmatic, cost-effective, and timely solutions. Case in point, 5,000 small wooden cottages (10x14 feet to 14x18 feet) were quickly built and housed over 16,000 San Francisco residents in the shelter crisis following the 1906 earthquake. San Francisco's Budget and Legislative Analyst found in 2016 that using SFPD officers and citations as a tool to deter homelessness was too expensive and that unsheltered homelessness actually increased by 16% when ticketing became more aggressive. The shelter system has 1,200 shelter beds—clearly not enough to provide housing for the some 7,000 who are homeless. The shelter waitlist recently reached a high of over 1,100 people. "A homeless person can get a one-night emergency shelter bed quickly," as reported in a San Francisco Chronicle article. "But anything else — supportive housing, longer-term shelter beds, mental health care, substance abuse services — requires a waiting list. If the waiting list is even taking new names. Some are so long, they're closed." What's more, "Not only are there too few shelters," Zordel says, "But many don't feel safe — especially the nearly 30 percent of people experiencing homelessness who are LGBT. So not only do we need more housing, we need more safe spaces to keep our LGBT community experiencing homelessness safe. Especially our transgender community." Also searchable by "Homeless Concerns_Wellbeing Check_Request for Service" and "Homeless Concerns_Aggresive Behavior_Request for Services"
The City of San Francisco's Human Service Agency provided a 60-day budget for the Pier 80 Temporary Shelter per a sunshine request earlier this year. The cost was estimated at $1,115,405 with a peak client count of 180, averaging just over $3,000 per month for each unhoused resident to receive temporary shelter, food, water, and access to toilets (no case management services were provided by Saint Vincent DePaul). This is an internal tracking tool used by DPW to identify and track conditions and open 311 cases for homeless encampments that was obtained through a public records request by the Coalition on Homelessness. This Navigation Center data shows that the vast majority of encampment residents who are targeted for a 30-day Navigation Center stay by the Encampment Resolution Team (ERT) of the City's Department of Homelessness & Supportive Housing (DHSH) return to the streets (aka "unstable exits") during or at the end of their 30-day stay. This San Francisco Digital Mapping Project identified 1,500 underutilized City-Owned remnant parcels of land that the City cannot sell and are challenging to find suitable uses for. Many of these sites are already utilized by unsanctioned tent encampments. The law, authored by Assemblywoman Nora Campos, D-San Jose, as Assembly Bill 2176 and signed by Gov. Jerry Brown on Sept. 27, goes into effect in January and sunsets in five years. It allows the city to temporarily suspend state building, safety and health codes for the purpose of building “unconventional” housing structures — everything from wood-framed sheds to tiny homes. The city will adopt its own regulations, the law says, based on some minimum standards. In August 2015, the Department of Justice issued a statement arguing that it is unconstitutional for cities to issue citations to homeless residents who sleep in public places when there is insufficient shelter space. Seattle City Ordinance No. 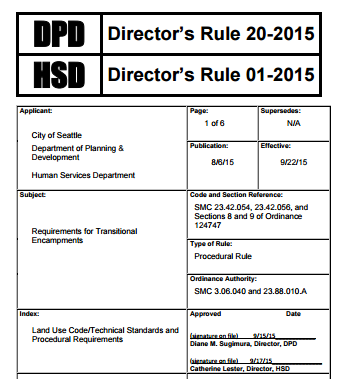 124747 authorized “transitional encampments” for homeless persons as a permitted “interim” use on City-owned property, private property, and educational Major Institutions according to the standards in Seattle Municipal Code (SMC) Section 23.42.056. Section 23.42.056.A requires the Directors of the Department of Planning and Development (DPD) and the Human Services Department (HSD) to adopt a joint rule establishing requirements for community outreach, encampment operations standards, and coordination with the permit process for new transitional encampments on any selected site meeting the requirements of the regulation. Seattle: An ordinance relating to City responses to people who are homeless living on public property; setting standards and procedures for remedying unsafe conditions and protecting the rights and property of homeless individuals. "A Right To Dream Too" is a project approved by Portland Oregon's local government that operates a "refuge and a safe space to rest or sleep undisturbed for Portland’s unhoused community who cannot access affordable housing or shelter." Portland City Council enacted an Oregon State Statute in 2004: In Resolution No. 36200, the City Council designated a portion of Sunderland Yard as a Designated Campground under the terms of ORS 446.265. This State statute allows municipalities to designate up to two sites as campgrounds to be used for “transitional housing accommodations” for “persons who lack permanent shelter and cannot be placed in other low income housing” and may be operated by private persons or nonprofit organizations. City Zoning Approval: The Madison Common Council voted to amend the city's zoning code to allow tiny houses, like the single 96-square-foot trailer-mounted cottageOccupy Madison has constructed so far, to be set up on the property of churches and other non-profit organizations. State Ordinance: A 2010 Washington state ordinance allows for temporary encampments on church property and limits permit fees to the cost associated with review and approval. City Ordinance: A 2004 ordinance of the City of Woodinville reaffirmed the city manager’s authority to negotiate and execute an agreement for the location of a temporary homeless encampment on certain city-owned property, declaring an emergency, and allowing for immediate effect.